It's hard to say what exactly the people of Zeal's diet would be. The people of Zeal are scholars and really focus on the aspects of advancing their knowledge even through dreams. So they probably had a diet that consisted of food that enhanced cognitive functions. Clean eating. Now, if the people of Zeal slept for extended periods of time they would also have to have a diet that could maintain their health for these extended periods. Would they before going into one of these sleep states eat in bulk high calorie foods? Or focus more on keeping a clear mind and go on a body cleanse right before and then while in the sleeping state be given liquid nutrients on an IV drip like someone who is in a coma? The people of Zeal would want to spend as much time sleeping or studying so food preparation and presentation would mean little to them. It would become more of a burden having to take extended amounts of time to focus on meals. Even though they would have clean eating habits it most likely would just be in the form of some liquid smoothie and it would be consumed only once or twice a day. They most likely would be vegetarians because protein from animals would be rare due to the issues with limited space to raise livestock. Protein most likely came from plants. Also, tea beverages are probably popular with helping to calm and focus ones mind. Fish... Lots of fish. Why? it's a small fishing village that probably isn't rolling in much dough. I'll go into more detail later on with this and the other area's. Also I always found interesting that they had refrigerators and stoves in 1000AD, from a technology standpoint. But now I wonder what kind of diet they had too, and as ThatGuy pointed out it's obvious they're quite carnivorous. As for what they eat exactly, the only thing I remember is in Arni they make Heckran Soup. That does bring up another question of where exactly they were with technology in 1000. 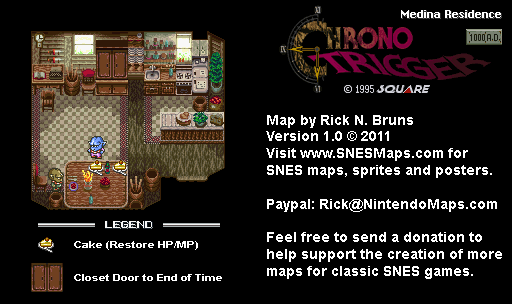 Thermodynamics for refrigerators, but Crono still uses a katana. As for Chrono cuisine, don't forget Skelly's favourite squid gut pasta. The "squid guts" part is more plausible than the "pasta" part, when you think about it--the ocean in El Nido should have plenty of squid, but pasta needs grain, and I don't remember us seeing any large cultivated areas. Wait a minute, there IS a Food page in the Compendium. Lots to go on in there. One time I challenged Lucca and Ayla to drink some poi and got SO SICK. The human body's appendix is called a vestigial organ, and I think its purpose was to digest that crap. I think it used to be a gizzard. Too bad the Eyes Cream never catched on.